Rizwan Iqbal from Community World Service Asia welcomed the guest speakers and students during the opening session. Display of IEC material on the 3rd day of Exhibition. “Behavior change is essential to bring any kind of change. 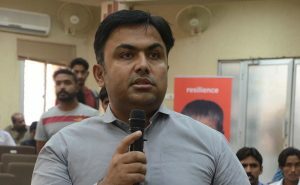 These issues are discussed on institutional level for the reason to built a better and resilient future,” shares Syed Khurram Khursheed, Interim Country Director, Muslim Aid Pakistan. 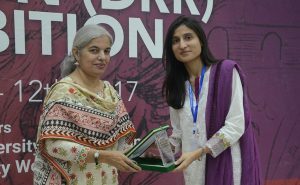 Zainab from Community World Service Asia presenting shield to Farah Munawar, Program Officer DRR, Oxfam. Zainab from Community World Service Asia presenting shield to Abdul Haque Banglani, Focal Person Emergency Response Municipal Committee, Bulhari, Jamshoro. Zainab from Community World Service Asia concluding the event with a Note of Thanks to all guest speakers and participants for coming together to further a vital cause. 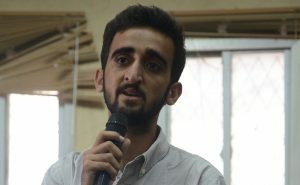 Ali Asghar Bhutto, student at Sindh University, shares his views regarding DRR during the question & answer session. Farah Munawar, Program Officer DRR, Oxfam addressing the audience during the Question & Answer session. Zainab and Rizwan Iqbal from Community World Service Asia share our role on Disaster Risk Reduction and the importance of the National DRR Conference with the team of HOT FM 105. A question answers session was conducted after all three sessions delivered today by the guest speakers. Participants including Government Officials, CSOs representatives, Faculty members and students attended the national event today. 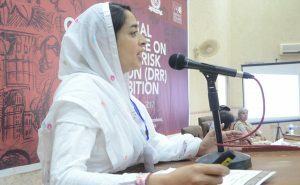 Ghazala Naeem, DRR Expert, delivering the introduction and objective of the National Conference on DRR today at University of Sindh. Prof. Dr. Fateh Muhammad Burfat, Vice Chancellor, University of Sindh, addressing the audience at the national event. 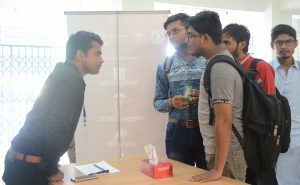 Students registering at the registration desk to attend the DRR National Conference at Sindh University, Jamshoro. In recent years, the world has become increasingly aware of the disastrous impacts of natural hazards and climate change. In an effort to minimize the damages and adverse consequences caused by natural forces, humanity has united together time and again with global frameworks and commitments. 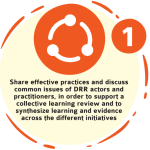 The Sendai Framework for Disaster Risk Reduction and Goal 11 of the UN Sustainable Development Goals for 2015-30 are some of the key commitments global communities are working towards. As signatories to these global commitments, Pakistan is compelled to make advances in its investments and efforts in Disaster Risk Reduction (DRR) and to draw a roadmap for its successful implementation and streamlining into national policies and development goals. 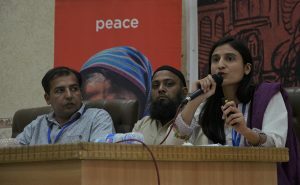 Guided by its strategic priorities and in pursuance of Pakistan’s national DRR agenda, Community World Service Asia conducted a two-day DRR conference and a one-day exhibition in collaboration with the University of Sindh in Jamshoro and Provincial Disaster Management Authority (PDMA) in Sindh, Pakistan in October (2017). This was the first of its kind conference ever to be conducted on DRR in the country. 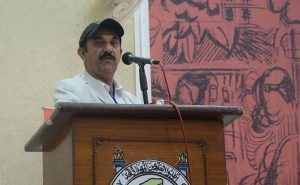 expressed Mohammad Ali Sheikh, Director Operation of PDMA, Sindh, who was guest speaker at the DRR conference in Sindh. 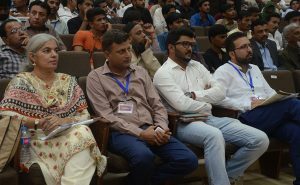 Professor Dr. Fateh Muhammad Burfat, Vice Chancellor, University of Sindh, officially opened the event and welcomed an audience of 383 participants, including 300 men and 83 women, at the national conference which was held at their University campus in Jamshoro. The conference gave a platform to climate specialists, relevant scholars, educationalists, government representatives, civil society members, humanitarian and development practitioners and students to speak on the topic and share ideas and experiences on DRR, its implementation and benefits. A large number of students, academia members and local NGO representatives attended the conference. 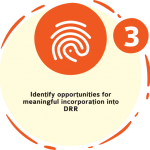 Participants at the conference and exhibition varied between experienced DRR and DRM practitioners and those planning to work on DRR in the future. 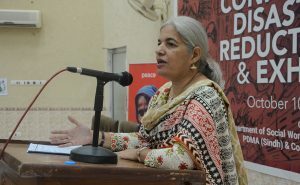 Local and international organizations such as Kacchi Community Development Association, Oxfam, Muslim Aid, Participatory Village Development Program, University of Peshawar, Malteser International, Municipal Committee Bolhari, Tearfund are among the many that participated in this national event. CWSA is co-hosting this Conference and one day exhibition in collaboration with University of Sindh and PDMA, sharing knowledge, experience and efforts on the subject to a wider range of stakeholders envisaging opportunities for future collaborations, building on the past investments and avoiding duplication of DRR efforts & resources. In addition, the Director of PDMA Sindh shared the overall functions and role of PDMA Sindh in the field of DRR and Disaster Risk Management (DRM). 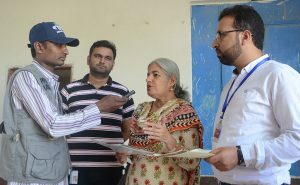 The Director also oriented participants on PDMA Sindh’s future plans, such as district disaster mapping and the establishment of Rescue 1122 at a district level. We are also in the stage of planning to establish a Provincial Disaster Management Institute which will aim at disseminating knowledge in relation to DRR. Over twenty guest speakers from various organizations and fields shared their knowledge on specialized aspects of DRR and DRM. Presentations ranged from Urban Search and Rescue Project to Research on Local Capacity Building on DRR. shared Col. Aijaz, General Manager ConPro Service, at the DRR Conference. He further added that the USAR teams are capable of national and international assistance in sudden onset of disasters. The members of the USAR teams are trained by a pool of internationally trained instructors. However, there is a need to further advance the teams; refresher courses and joint exercises of the existing teams need to be conducted to update knowledge and skills of the team members. 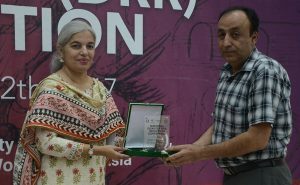 Abdul Qayoom Bhutto, Director, Pakistan Meteorological Department (PMD), ilustrated PMD’s Early Warning System (EWS) of DRR. PMD’s EWS of DRR mitigates the potential damages for sustained socio-economic development from various natural hazards including floods, cyclones, landslides, drought, heavy rains and more. We have a combination of technology and associated policies and procedures designed to predict and mitigate the harm of natural and human-induced disasters. To further advance the functions of PMD, continuous coordination among stakeholders at all levels are required. 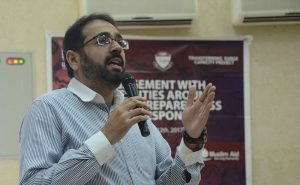 shared Dr. Ibrar, University of Peshawar, during his session on Social Work and the Sendai Framework for Disaster Risk Reduction. On both days of the presentation-based conference, the discussions and question-and-answer sessions facilitated participants’ engagement on Disaster Risk Reduction and Disaster Risk Management (DRM) issues. These discussions were an effective platform to engage the youth, encouraging them to use their enthusiasm and skills in DRR and DRM projects. The participants shared their vision for inspiring and equipping students for DRR and DRM and developing a task force to respond to any future district-level emergency. The conference helped bridge the gap between DRR professionals working on field and DRR experts researching on DRR-compliant infrastructures. Attendants left the conference with a greater knowledge of disaster resilience and management, which would help strengthen and develop organizational structures on the theme. Some were also able to discuss prospective partnerships and collaborative work. Ideas such as possible collaborative trainings for District Disaster Management Authority staff and university volunteers on Urban Search and Rescue were also highlighted. Moreover, the participants discussed promoting research-oriented DRR initiatives among each other. 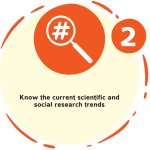 Both structural and non-structural DRR initiatives would benefit communities by bringing technical and social research into practice. Participants agreed that it is important to establish effective policy and legal arrangements for mainstreaming DRR into safety regulations, like building codes, and other development laws. Not only would this help protect people from the adverse impact of natural disasters but it would also support the availability of appropriate financial and technical resources for DRR at local and national levels. 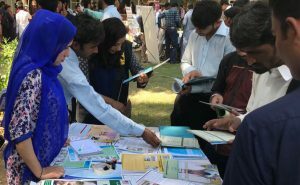 To highlight the good work of local, national and international organization in the area of DRR in Sindh, Community World Service Asia organized a one day Exhibition showcasing best practices and visibility material on the initiatives taken so far. 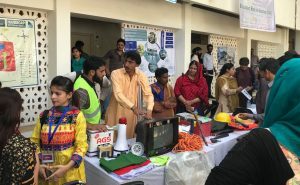 A number of organizations had set up stalls at this exhibition held at the Sindh University and provided live demonstrations of emergency and relief services. This initiative helped in promoting the various DRR models practically and also acted as a bridge connecting researchers, students and NGOs to work in a collaborative way. 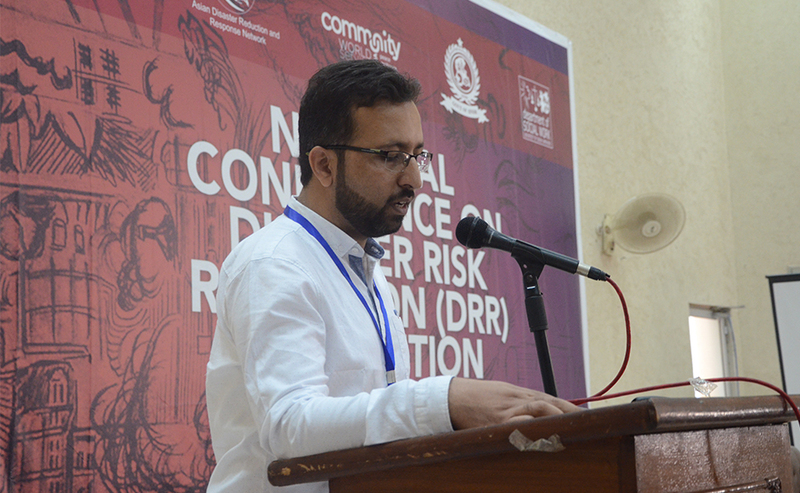 The National DRR Conference and Exhibition was an unprecedented event conducted in University of Sindh. This was a new learning experiencing for all of us, as [DRR] is a very important topic. It is vital for the [social work] department since we will be able to play an active role in promoting DRR through our social work. It further enhanced our knowledge in how to keep ourselves safe from the natural disasters which are continual and often unpredictable. We now know which organizations to approach for information or aid at times of disasters. The guest speakers shared their valuable contribution in the field of DRR. As a social worker, I will be able to share my learning about preparing oneself in times of emergencies with local communities. I plan to research on future trainings on disaster management so that I can volunteer my services if any emergency situation arises. The National Conference on DRR was highly appreciated and the various stakeholders of DRR interventions have been encouraged to enhance and increase their work on helping build disaster resilient communities and decrease disaster impacts through informative workshops and engaging discussions conducted during the three day event.